How to grow up, deal with changes – and tame an elk? Number of pages: 190 pp. Johanna has just started middle school and many things have changed during the summer. Her best friend Sandra, for instance. Sandra has started to spend time with the most popular girls in their year and is doing anything to get their approval. Johanna only wants things to be as they were. Luckily, Johannas’s got her forest den, where she can enjoy the fresh forest air and study the animals in peace. Malin Klingenberg writes in a serious but light-hearted way about being a teenager in the throes of changes. And about taming an elk. 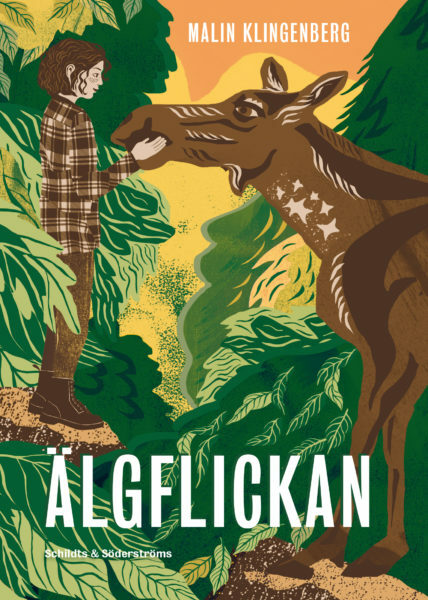 Elk Girl is a touching young adult novel from Malin Klingenberg, following her popular middle grade novel series about the adventures of The Senior Squad. Critics and readers alike have heaped praise on the book. “I stepped down from my bed silently and went out the front. I thought an elk would be afraid of me but even though they must’ve noticed me, they only pricked up their ears. I sneaked closer. One of the elks turned its head and looked at me whilst slowly chewing a tuft of grass. I knew it was ridiculous to smile at an elk but I couldn’t help myself.